View cart “1 Port PCI Express RS422/485” has been added to your cart. If you need to add additional USB 3.0 ports to you PC, this PCIe host controller card allows you to do it with no problems. 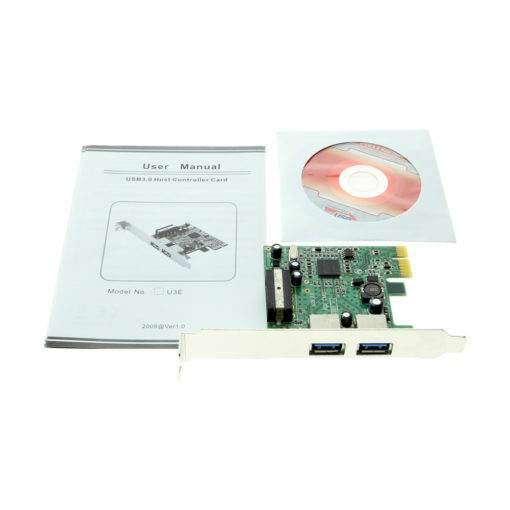 Works with Windows XP, VISTA, and Win 7 systems, simply use an available PCIe slot and the included driver disk and you’re ready. Add two USB 3.0 port to your desktop computer using this USB 3 PCIe host controller card. The USB 3.0 card is easily installed into your PC system along with its included driver disk and is compliant with both USB 3.0 and PCI Base Specifications. Supports external power socket in order to supply power for each USB 3.0 Connector up to 900Ma per port.